It's monkey business for a limited time and a very grand "bag of sand" promotion on what is probably the best bike in terms of value and performance we have ever produced. These are October specials as we get ready for the Black Friday month onslaught, time to do four special builds, cut them to the bone, and get them out the door before the November retail mayhem. Cockney slang editions - the monkey bikes are of course a flat 500 quid, and a bag of sand edition a nice round grand - or if your good at maths 2 monkeys. My mate Tim and his missus Sally asked me a few months ago to build a couple of bikes for bobbing around town on. They did not want a flashy road barred racing machine, just a "don't nick me" all-rounder comfy nice bike to get out and about. Anyway they are pretty happy with the result and we are clearing out the last of the Holdsworth Elan bikes so I figured we would make this a special edition "Tim and Sally Monkey Edition". So a paltry 500 quid buys you this bike, comfy, utilitarian, do it all all-rounder for knocking aroundthe streets of Sheffield. Tim is, of course, the UK organiser of L'Eroica and being a bit of a cool dude insists on the appropriate clothing of the era for his daily ride. Check out the Monkey 1 Tim and Sally special edition by clicking on the photo below. "Great for mixing style and substance"
Tim is only just getting used to riding again after a layoff so be careful if you see him wobbling around the streets of Sheffield. "These On-One Mary bars take a bit of getting used to"
Classic Holdsworth Brevett with Shimano 105 and fulcrum racing wheels. It's only a monkey and it's great if you fancy a classic steel bike ideal for riding with your mates and great days out. Click on the below link to check it out. 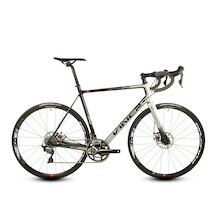 "Great for riding in groups"
As above but with Sram Rival 11 speed and flat bar. Click on the link to see the bike. "Great all rounder and super comfy "
It's a very very special bag of sand at only a grand. The Viner Mitus bike is an absolute top spec frame, raced by the Zappi pro team a couple seasons back it is a very classy subtle ride. It is overshadowed in our range by the muscular and dominant EC130 however the subtlety of ride over the brash half-brother make this the connoisseur's choice. It has never really caught on, so we are closing them out with a glittering spec unrivaled at this price point. Featuring Ultegra groupset and Fulcrum 600 wheels this is a great handling bike, classy and subtle, best value bike we have ever offered. Click on the special bag of sand and be warned you might spend a grand "